As a massive fan of the TV program 'Miranda', when one of my best friends gave me this as a birthday present at the end of December I was very excited. It definitely didn't disappoint either. This book isn't what I expected it to be. It's not the typical book written by someone 'famous' that's an autobiography they release seemingly for the sake of being able to say they've written a book. In Is It Just Me? Miranda tells many different funny stories that have happened over the years or just her opinions on certain topics and often talks to her 18-year-old self giving her helpful little hints and tips. Having spoken to other people who have read this book, I've realised it maybe isn't to everyone's taste. A few people that are fans of the TV show 'Miranda' that have tried reading this book said they didn't enjoy it. Obviously I am here to give my opinion on the matter and I can honestly say, I thought this book was fantastic. 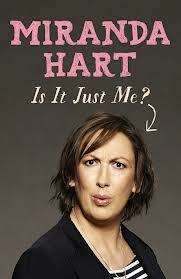 I found this book really unique due to the style of it and I don't think anyone who enjoys both reading and Miranda's TV show won't be disappointed with this read. It's definitely worth it for me.